More and more people are now into travelling. In fact, travel and tourism industry is one of the world’s largest industries, contributing approximately 7 trillion dollars to the global economy. No wonder many travel agencies are emerging everywhere, each offering different travel packages to their customers. But for smaller agencies, it can be a real struggle to compete in this growing industry. Luckily, there are ways to improve this situation – effective promotion and marketing. When it comes to promotion, brochures can be of big help. They can be obtained even if you’re strict on budget and are fast and easy to disseminate. The only catch is you need to make sure that they are optimally designed to achieve an effective result. For travel brochures, the design must make its reader feel emotions such as excitement, enthusiasm, and wonder. This post will show you some inspirational examples of travel brochures with enticing designs. Observe the different styles and techniques that were used in these works and see which can be adapted to your own design project. Come, take a peek, and enjoy! 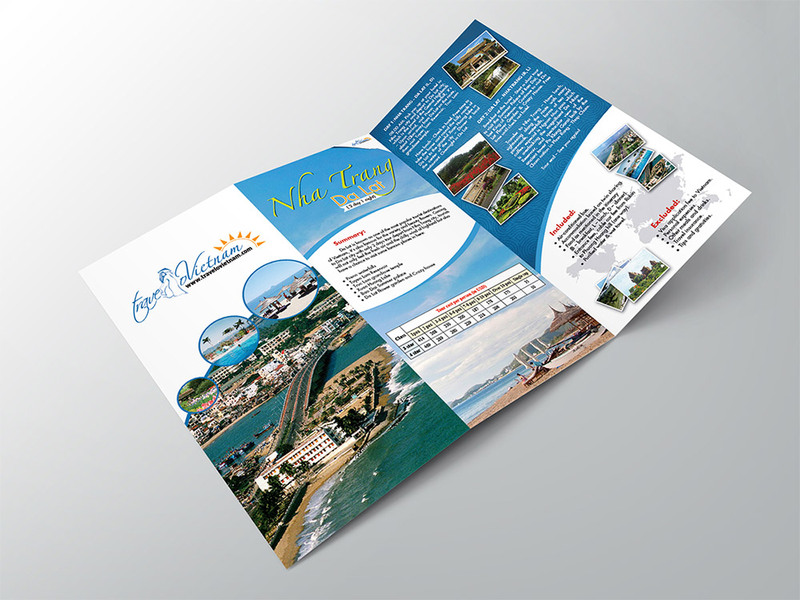 This first example is in landscape booklet style that is perfect for a travel agency. It incorporates several design elements such as background images, circular frames, and lovely typography. This blue-themed brochure is sure to fire-up the readers’ desire to go on a travel. 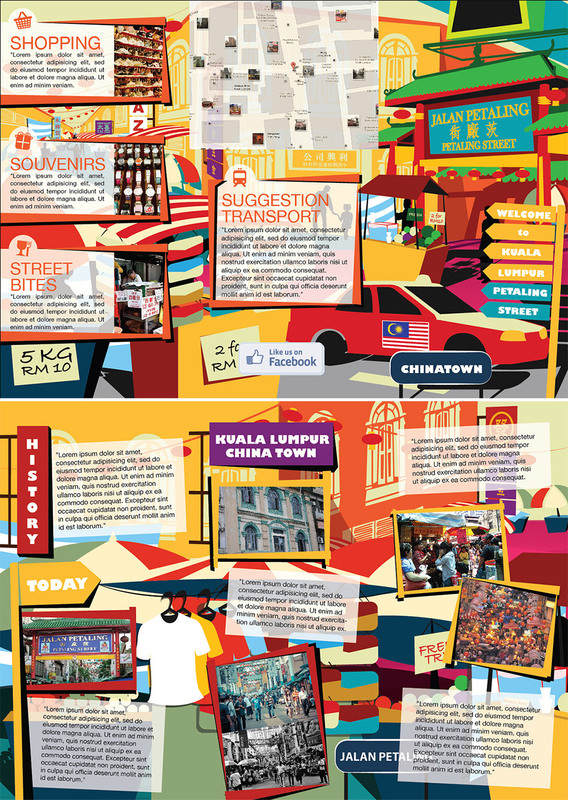 This brochure is a city guide that contains artistic layouts that will engage the interest to the tourists. It caters to its readers with tourist guides for Stockholm including hotels, transportation, and hotspots. The color theme is based on Stockholm’s flag. Here is a brochure for a small ship cruise specialist company in Croatia. The design entails detailed information about the company such as destinations, schedules, ship models, prices, and more. It is a clean, simple, and concise material that also includes enticing images to heighten the readers’ interest. 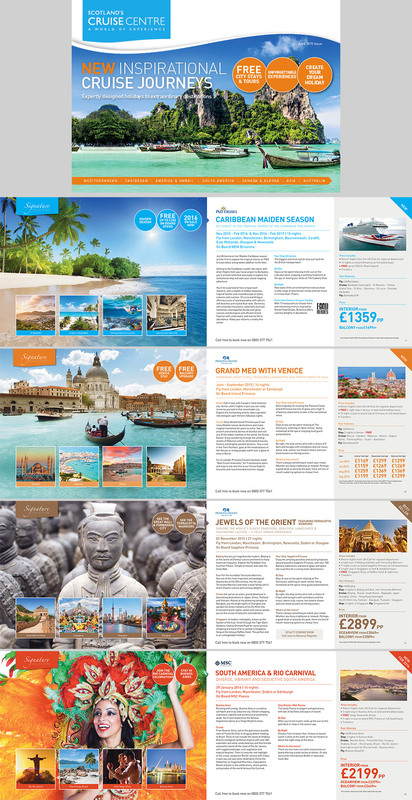 This travel brochure is for another cruise specialist agency. Its layout will allure your eyes with images of various travel sceneries. It contains background images and detailed information including prices, itineraries, destinations, etc. This next design is great if you personally love and offer both travel and golf entertainment. This brochure is for a luxury river cruise company that also has European golfing on their services. It has a clean design that delivers images and information about the travel experience being offered. Karpathos’ travel brochure is a square bifold model. Its cover is designed with full background scenery and the name at the center, contrasted by its white background and transparent red border. The content layout shows more sceneries and information to entice its readers. This design is specifically designed to target 18-35 year-olds. It is seen with its lively design that showcases vibrant colors and creative layout. Some of the design also includes maps that show the travel route depending on what country. 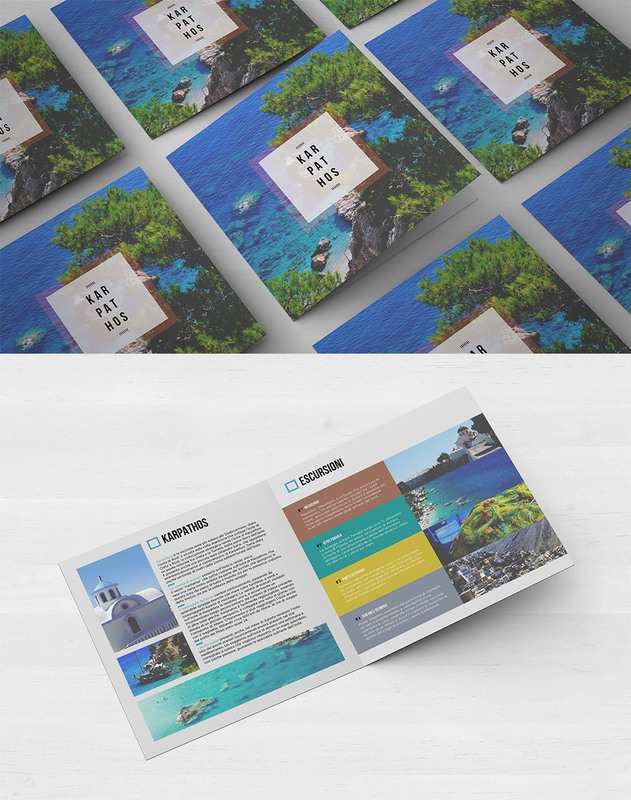 Vertical Blue brochure is a great example for diving resorts. The design incorporates a full-width background of its beautiful sceneries. The color scheme also jives with the ocean water theme, ranging from pastel green to blue. The inner content shows information of their location, packages, and other information that can be useful for the reader. This travel brochure is for a travel agency that specializes in culinary tours in Asia. The brochure is designed with earth tone colors and background textures to add more depth. This trifold model contains essential information and images that will give its readers some insights to the tour. 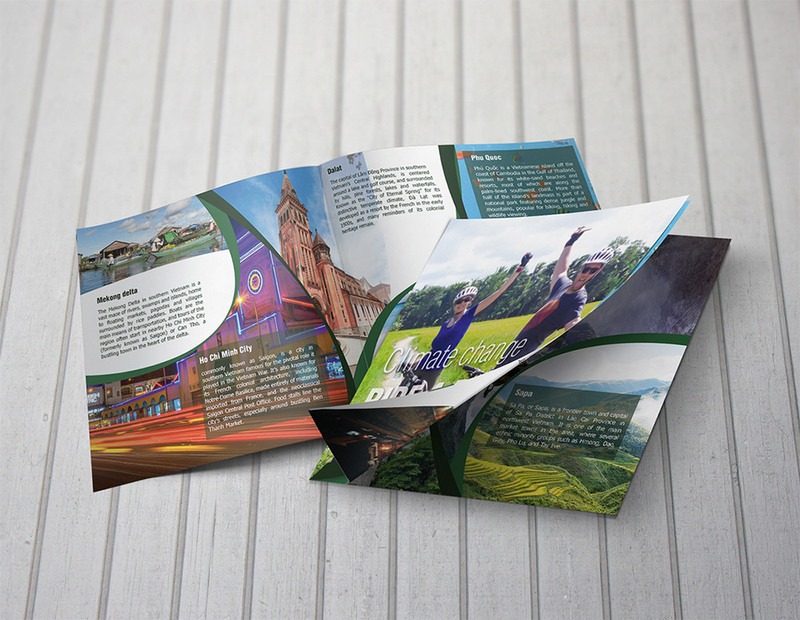 Here is a trifold brochure that serves as a tourist guide. As you may notice, it is creatively filled with vibrant background illustrations that explode with colors, the foreground is designed with photos and boxes to put information to, and the back, has a map as a guide. This next example is also trifold brochure with a conventional design. It incorporates lovely images of sceneries to attract its reader into travelling. The information is nicely organized to avoid confusion to the reader. 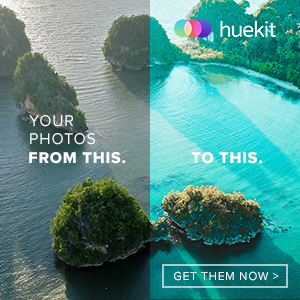 This brochure design integrates a full-width background image. It also includes information like address, schedules, prices, etc. 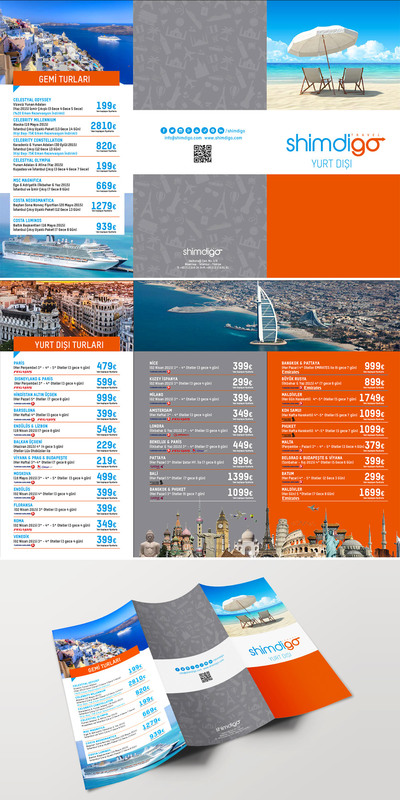 Here is another vibrant design of a travel brochure. You can see the nicely picked images and how they are mixed into the pages of this material. 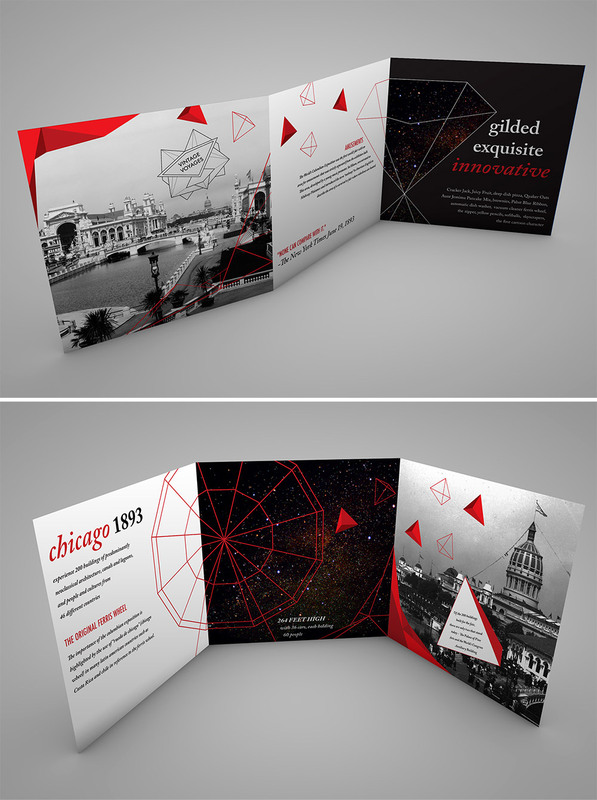 Vintage Voyages utilizes an artistic brochure design by going for some greyscale images. The whole brochure is made more elegant by adding some red elements and nice font styles. For this last example, the design also utilizes lovely sceneries as well as perfect combination of blue and orange. At the back, you’ll notice a greyscale pattern that adds some fun to the brochure.